Moving to a small town sounded like a great plan to Mia and Adam . It would elimnate the horrible commute that Mia drives everyday . When Adam found a great house for a low price they do what any couple would do and put an offer in and got it . This is house is more then it seems though, once Mia sees the house she is filled with an uneasy feeling and can't shake it . After a visit from pastor Weston things start to go weird . Mia and the ghost have become attached and all isn't what it seems . 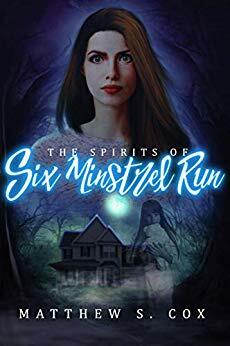 Mia is fearing the worst that the ghost child is isn't what she seems to be and something more sinister is at play here . The characters are so very well written and complex . Mia and Adam are a young couple who want the american dream of owning their own home . Mia is a strong woman who will do whatever it takes to keep her and her husband safe . She does get to freak out a few times but over all she is strong and determined even though she has had a horrible past . Adam is well he is kind of a dweeb every now and then sometimes he comes off as inconsiderate of what Mia is going through. Then there are times where he is the hero and saves Mia . Robin well she is the little girl that is haunting the house you don't knwo which way she will go . She can be a sweet girl and then there is the evil side of her that comes out . Oh the character i love is Wilehmenia she is such a cool character . She helps out the couple with wiccan help . She is strong and headstrong and you will love her . You will love these characters or hate them if you are inclined . I sat down to start reading this book looking forward to see how the author handles a ghost story . What I wasn't expecting is to be sucked into a story that at times had the hairs on my arms standing up and chills running up my spine . The book started off as a good ghost story , the characters are amazing but as you read the book it got creepier and creepier . The author has so much going on from ghosts . to human behaviour and a religious zealo running awry . It blends into a book that you can't put down and has you on the edge of your seat through out the whole story This is a story for those of us like me who love a great ghost story that isn't full of guts and gore . This story makes you think about how you would handle things . So I will say this read this book, you will not be disappointed and you will get a great ghost story .